"THE GOLDEN DECLARATION" Jan. 22, 1940. Our people of Ethiopia! Listen! Thanks be to Almighty God who is impartial to all. Who can break the arms of the strong and who stands by the oppressed. When Our long-time enemy, Italy, crossed Our border and occupied Our country by aggressive force, we fought to defend Our country as much as we could and then went to Europe to solicit help while you, patriots of Ethiopia, continued the struggle and waited for us fighting day and night in the forests and mountains against the militarily superior brutal enemy, in taking advantage of your natural heroism as your greatest weapon, never putting aside your swords, abandoning your flag or surrendering to alien rule. As you now see, your five-year struggle has made it possible for you to witness the fruits of your efforts and sacrifices. We have told you before that we have brought for you with us, the aid of Great Britain which promised us to completely dispel Our enemy from Our country and restore Our independence. Our happiness is boundless when we announce to you that we have returned to Our beloved country, with God's will, and to be present amidst Our people whom We have been missing for some time. You know how grim life is to people robbed of their government, independence and their motherland. The time has now come when each and everyone of us should protect and serve Our beloved country, Ethiopia, with more zeal and vigour. The Almighty God has been merciful to all of us. Therefore, we have given mercy to those of you who, willingly or unwillingly, betrayed your country and your Emperor while here or abroad, and we urge you, wherever you may be, to raise your arms against the enemy who has come, determined to destroy your race, confiscate your property and spoil your name. Now you must throw him out of Ethiopia. Italy is now in great despair, pressured by Great Britain's air, sea and land forces and those Italian soldiers remaining in Our country will not be beyond the challenge of Our reliable patriotic forces. We express Our gratitude to the government and people of Great Britain, for all the world to hear, on behalf of you and Ourselves, for the warm, generous and cordial reception and welcome they accorded us during Our most trying period. 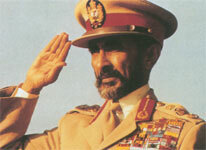 Long live independent Ethiopia! Long live Great Britain!